Canoe Ridge Creations: this week. >>under the weather with a head cold. >>enjoying the world series games. 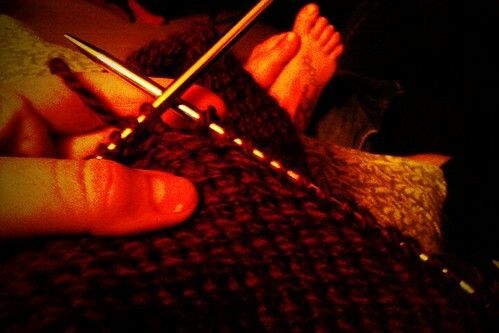 >>knitting like a mad woman. knitt-ING, knitt-ING, knitt-ING (that is my lame knitting cheer- you like it?). I have a cold, too. Makes you want to hunker down under a warm quilt and watch t.v., eh? Feel better! Hope you feel better soon! I feel a cold coming on, and our air con at work that couldn't cool us all summer, has suddenly started to work and is freezing us - ugh! I think I have a Sewing Summit hangover, can't get out of this funk! But I have been knitting & doing a little sewing getting ready for the local Christmas bazaar in December. Hope you feel better soon! Boo to the cold! Feel better soon. Lovely knitting :) Hope you feel better soon!